My girlfriend is worst: She is materialistic, although we don't have any money to argue about in the first place. Would be interested in seeing if this finding is specific to married couples only, or also to unmarried couples in long-term relationships. Likewise, does the length of marriage have any impact on the finding? What about the impact of who is earning the money in the relationship...are the findings different for two-earner couples than for single earner couples? For whom? There is a woman I know. she has been married three times. recently had face lift, and even more recently lost around 25 pounds. She appears to be quite materialistic. Nonetheless, she also appears to be a bit ignorant of what accounts for it. So she says, no more husbands for me. Now if she understood her problem, would she not have a choice as to how to deal with it? Their results are societally compelling in that they argue that their results show that the more "materialistic" spouses there are in a couple (0 vs 1 vs 2), the greater the conflict/unhappiness/etc. At first their analyses looked pretty good, except for a huge thing at the beginning which makes feel skeptical towards their findings. 1) They didn't address what they did with the people who probably ranked "neutral" as is a common answer on these types of scales. Actually, I didn't find whether or not they had a "neutral" on the scale and if they didn't have a neutral option, then they're forcing people to categorize themselves when perhaps they're not particularly biased one way or another. 2) Breaking what's called a "continuous" variable (the 5-item scale) into a "categorical" variable (defined categories to compare to each other) is a big no-no in stats. You lose all sorts of information by doing this. And it's saying that someone who said "slightly disagree" is in a completely different category from someone who said "slightly agree" which is really taking liberties with the data. Another way to illustrate the way this isn't great is by creating "categorical" variables out of age. So you have a range of people age 10 - 80 and instead of analyzing that variable as a continuous variable, you say, I want to compare old people to young people. So you say, everyone from 10 - 40 years is "young" and everybody from "41 to 80" is old. How different are 40 and 41, really? And how different are 39 and 42? Here, you're saying they're completely different categories, but that's just a false boundary you created in your data. 3) Using only 1 item, when you could have easily thrown in a whole questionnaire (or more!) to increase reliability and validity is just ridiculous. The reliability of 1 item is completely zilch, so to base your entire analysis and argument on the way people answered 1 question is pretty silly. It's disappointing that freaknomics is promoting this article since I thought they'd have gleaned this stuff out. Oh, really? 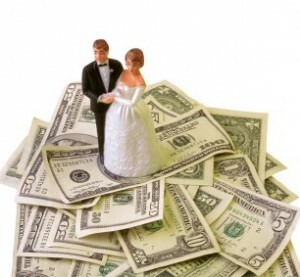 Materialistic couples may make for a worse marriage? shocking. Next Post »Did Blackberry Outages Cut Abu Dhabi Traffic Accidents by 40 Percent?